Fuel costs are through the roof these days, but at 300+ miles per gallon, who cares? Volkswagen's new XL1 hybrid auto is a dream come true for frugal refuellers, delivering a budget-friendly 313.9mpg and a top speed of 99mph. The uber economic motor went on sale in the UK earlier earlier this month, marking up at a hefty £98,515 - a big ask but the fuel savings are phenomenal. The car was first unveiled at the Qatar Motor Show back in 2011, and is confirmed for an initial run of 250 vehicles worldwide, 30 of which have landed a spot in the UK. The XL1 is a hybrid meaning it runs off two engines; a 27 horsepower electric motor that'll take you up to 22mph, and a diesel engine that powers the car beyond that. Not only is the car economical, it's also eco-friendly - the XL1 discharges a paltry 21g of CO2 per kilometre. VW's green machine is lightweight too, weighing in at just 795kg, mostly thanks to its use of feathery materials like magnesium, ceramics, and aluminium. Just 23.3% of the car is made from steel or iron. 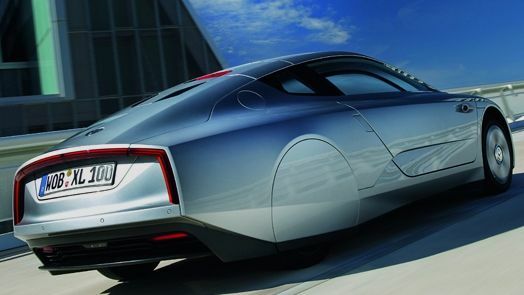 VW's XL1 is just short of 4 metres long and around 1.6 metres wide, with a sportscar height of 1.2 metres. The car operates elegant scissor doors too, so you can save fuel and stay stylish at the same time - we call it eco-chic.